Speedmonkey: What's The Range Rover Sport Like For A Family On A Roadtrip? What's The Range Rover Sport Like For A Family On A Roadtrip? My son, Eddie, and his best friend, Jamie, were due to go on a school trip to Cologne but the trip was oversubscribed and they were told they couldn't go. Sod the school, I had a Range Rover Sport SDV6 Autobiography booked in November - let's drive there ourselves! And so it was. At short notice Land Rover added my friend Michelle (Jamie's mum) to the Range Rover's insurance, I booked a hotel and Eurotunnel tickets and the trip was on. Friday, 7pm we left West Berkshire in the dark. The Sport is a large car but we had a lot of stuff and filled it right up. 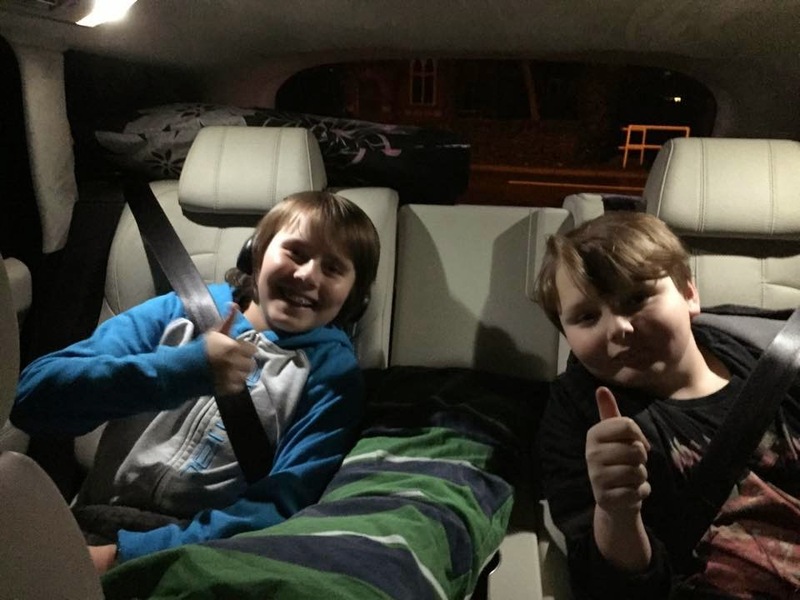 The boys on the back seat had lots of room but then they filled it with bags, food and duvets. They also had televisions set into the front seat headrests and their own wireless headphones. The rear seat has a large armrest which contains two cupholders and a storage area in which the remote for the rear infotainment is kept. There are decent sized door pockets and nets on the back of the front seats. In the front you get the door pockets, quite a small glovebox, twin cupholders aft of the gear lever and a fridge under the armrest. The fridge has a cover over the top with small storage spaces built in but if you want to get to the fridge itself you remove the cover and anything on it falls off. The cupholders are fine but soon became full of phones, chargers and general stuff. To be honest the car could do with a little more in the way of storage. It does have the tech side covered though with three 12v points and two USB points in the cabin. The boot is vast. It's flat and has a full sized (22 inch) spare wheel replete with alloy under it. Everyone had a bag and we had food, coats, pillows and more junk. It swallowed everything with ease. Being winter it was nice to be able to open and close the boot via the keyring - saving on dirty fingers every time we wanted to get to something. The Sport is a tall car and sits high up. You climb into it and shorter types can struggle. You can select 'Access' height on the suspension which lowers it a touch but it's still high up. Michelle struggled to close the door from inside as she's not exactly tall. No matter, once you're inside it's absolutely lovely. The surfaces, layout and materials are all top notch. Purely to look at and spend time in I can hardly think of a better car. You also look down on almost all cars. Think your X5/Q5 is a big car? Anyone in a Range Rover Sport will look down at you and your sense of superiority will melt away to be replaced by a nagging sense of jealousy. The infotainment system is excellent. The back seat passengers can watch television or a DVD whilst those in the front can listen to digital radio or stream music from a phone. We connected my phone and Michelle's phone. You can select either easily enough without booting the other out of the system. The front seats are incredibly comfortable. They electrically adjust up, down, forwards, back, squab forward or back, headrest up and down, lumbar up down in and out and side bolsters in or out. They have memory settings so we could press a button and the seat (and steering wheel) would adjust to a preset position. The digital dials are clear and contain satnav and other pieces of info in between. The satnav is a bit laggy but the lady who speaks directions is clear and precise. I drove at first - Berkshire to Folkestone where we loaded on to the Eurotunnel at nearly midnight. The car was a dream on the motorway. The air suspension makes for a smooth ride, the engine is powerful and quiet and the adaptive cruise control is the best I've ever tested. The cruise is the only system I've experienced that works in traffic jams. Other systems stop working under 10mph or so. Loading on to the train was interesting. The Sport is tall and wide. As we drove down the train the steel kerbs were inches either side of the tyres, and occasionally a tyre would brush against a kerb with a loud squeal. After a short trip under the English Channel we were in Calais and time moved forwards so it was 1.30am CET. The headlights were electronically reset to driving on the wrong side of the road and the speedo changed to kmh. We drove non-stop for 200 miles through France, Holland and Belgium before eventually stopping in a service station for a couple hours snooze. As you enter a new country the satnav lady shrills, "Welcome to France." After a nap we set off again and soon crossed the border into Germany. Bliss - autobahns! Welcome to Germany indeed. The Germans drive noticeably better than the French, Dutch and Belgians with more respect for distance, speed and other drivers. In the dark we hit 130mph, but no-one noticed because they were all asleep. I'd put the new Pink Floyd album on and felt utter serenity speeding through the night on empty roads in the Sport. Colgne, 7.30am CET. We left the car at the hotel's underground car park and spent the day visiting the cathedral, city centre shops and zoo before heading back to the hotel for a late afternoon nap. The evening saw us visit a Christmas market and the Glowing Rooms, which is basically 3D minigolf in flourescently painted rooms and is utterly fabulous. Back at the hotel at 1am we all slept like logs, woke up, breakfasted and left Cologne at 10am. Back on the autobahn and this time everyone was awake. We travelled at the Sport's top speed of 135mph for a few miles and, again, it felt serene, unflappable and completely at ease. Michelle took over the driving in Belgium. She'd never driven on the continent before but such is the ease of driving the Range Rover Sport found it a piece of cake. I feel asleep in the passenger seat whilst the boys watched DVDs in the back. We were late for our train but no matter, Eurotunnel put us on the next one. As we entered England in the dark of late afternoon the heavens opened. Surprisingly the adaptive cruise control continued to work. The M25 was miserable but the Sport made progress as good as it is possible in a car. We arrived home at 7pm having driven 820 miles in 48 hours. We'd spent around 20 hours in the Range Rover and it had rewarded us with a delightful experience. Nobody got sore legs or a numb bum, everyone agreed it was an awesome car. The only disappointment was the fuel consumption. I'd hoped to cover all 820 miles on one tank, possible at just over 40mpg, but in the end the average was 30mpg and we had to brim it in Germany. In the Range Rover Sport SDV6 Autobiography Land Rover has created one of the greatest motor cars of modern times. It does everything you would want from a car. See my review for full details and specs.